Whether it’s represented by the wheel of a bicycle or the cycle of the seasons, Asheville painter Nancy Hilliard Joyce finds inspiration in the form of a circle and the ideas that it represents: freedom, progress, and constant renewal. Her approach to her production method has come to resemble the form she admires—she moves through a body of work fluidly, then circles back around to pick up the rhythm of a new one. Perhaps not coincidentally, Joyce describes her path to a career as a painter as “circuitous.” While she has made art since she was 10 and attended the Governor’s School of the Arts and Humanities in South Carolina, she taught art and managed marketing for law firms before committing herself to painting full time. Since then, she has built her work in groupings or series: work concerned with nature and life cycles; depictions of powerful women; and last year, her most overt expression of the circle so far—a series of women and girls on bicycles. The paintings were inspired by a Susan B. Anthony quote: “I think [bicycling] has done more to emancipate women than anything else in the world. It gives women a feeling of freedom and self-reliance. I stand and rejoice every time I see a woman ride by on a wheel ... the picture of free, untrammeled womanhood.” This sentiment sparked Joyce’s 2015 show Bicyclette, featuring women and girls on bikes or with other circular objects such as umbrellas. With money raised from the sale of her paintings, Joyce purchased over 100 bicycles for Lotus Outreach International, which gives them to young Cambodian women for whom a bike truly represents the freedom Anthony talked about. Giving back is an essential spoke in the wheel for Joyce and one of her main motivators. She’s always involved in philanthropic projects, whether it’s the proceeds she donated to Girls on the Run or the art she gives to Asheville’s annual Open Doors auction. 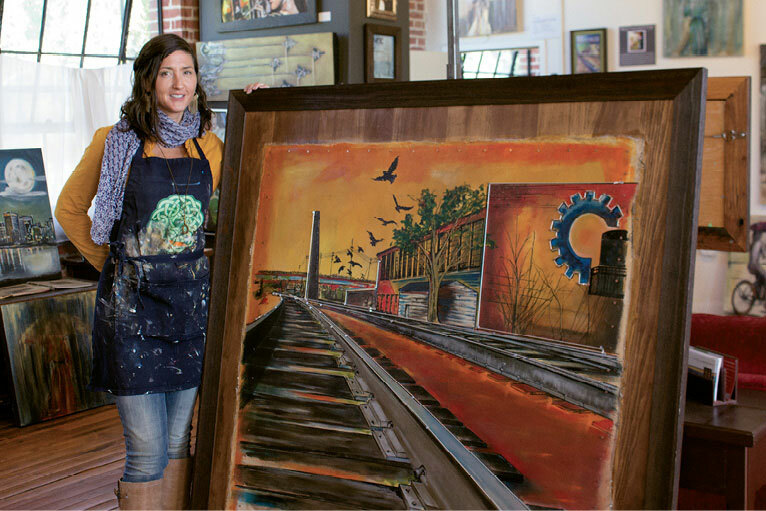 In addition to inspiring her work, it’s a win-win for those who purchase her paintings, offering the added bonus of contributing to a good cause. Lately, Joyce is collaborating with three artists on a series about monarch butterflies and their endangered migration. For Joyce, the chrysalis stage is the most fascinating part of the monarch’s life cycle, maybe because it’s at this point when something new and completely unexpected emerges, just as it always does for her when she starts a new body of work.